The training was a 3-day “Brown Belt” course, which is the closest equivalent Salesforce currently has to an implementation expert certification… There’s some more sessions going on right now, so ask your Account Executive or Partner Manager if you’re interested! Back in November, there were a lot of moments where you had to dig into code in order to import datasets, transform the data, or fully configure a dashboard. While you still have the option to use code to do all that, I’m happy to report that that’s no longer required! When Analytics Cloud was first being marketed, Salesforce emphasized that any data, structured or unstructured, could be imported. Since then, they’ve refocused their pitch on using Salesforce data as the key component, with other data sources as “decoration”, or augmenting the Salesforce pieces. With all of these fancy-looking pie charts, you might think that Analytics Cloud is going to replace those Reports & Dashboards on your other Salesforce clouds – Gladly / Sadly, that is definitely not the case. Think of AC as the strategic tool to report across business processes over time, whereas Salesforce Dashboards are for one-time analyses of operational data (for tracking & measuring things vs. basing long-term strategy on). Although the Salesforce page on this topic looks pretty impressive, the technology that powers Wave is actually not as novel as you might think. Key-value store databases have been around since the 70s, SAQL is essentially a customization of Apache Pig, and EdgeSpring (the company bought by Salesforce in 2013 for an undisclosed sum) had been developing the Edgemart and visualization features since at least 2010. The difference of course has been combining them all together into one sleek-looking package. One giant advantage of being a Gold Partner is that product managers sometimes give you glimpses into what is in the pipeline. Without going against any NDA or #safeharbor, all I can say is that Salesforce is putting a ton of effort into Analytics Cloud, so much so that their release timetable is actually doubled compared to the standard Winter / Spring / Summer schedule. The product team seems well aware of AC’s shortcomings, and is already thinking through some really neat features for the near- and long-term future. Trust me when I say that some very big EBUs (Enterprise Business Units) are already using Analytics Cloud. Actually, you don’t need to trust me since Salesforce is now publicizing those: Coca Cola, GE Capital, Blue Cross Blue Shield, EMC, Akamai,… Sure, they probably have some other analytics platforms running as well, but who knows how long that will last! OK, the numbers look pretty big on the Salesforce website, but think about what you’re getting – A cloud-based analytics platform that is instantly mobile-enabled and connected to your Salesforce data, without any extra infrastructure costs. When you look at competitors, they are either much more technical to implement (Informatica, Tableau), or they’re built for only IT to use (SAP BO, Oracle BI). 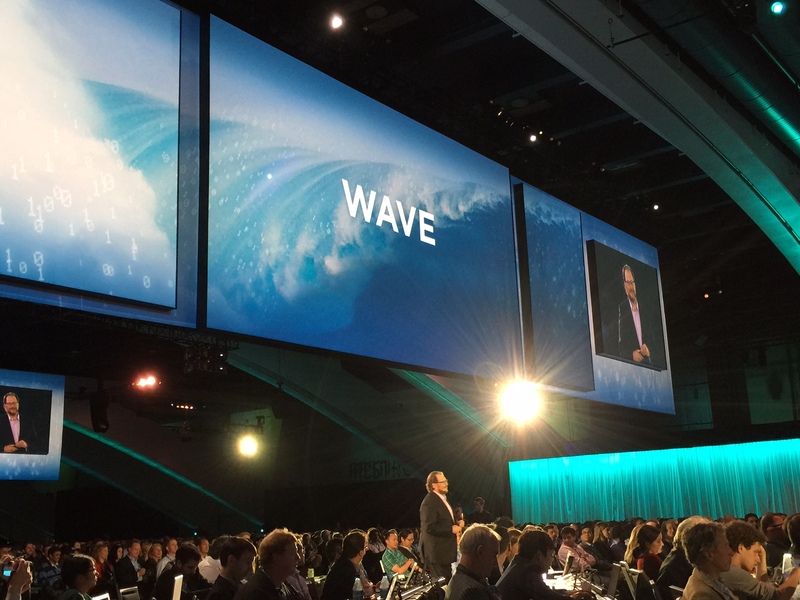 My guess is Benioff got a little too excited by the name at Dreamforce ‘14, and now everyone thinks it’s “Salesforce Wave”… The giant inflatable surfboard made it all worth it though!